In this article, you'll discover how team-building activities benefit high school students, ways to ensure team-building activities will be successful, and a variety of classroom-tested activities. 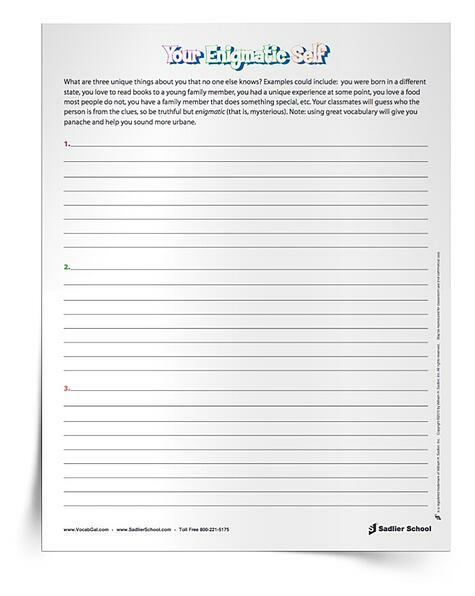 Plus, download free printable team-building activities that can be used at the start of a new school year or new semester! 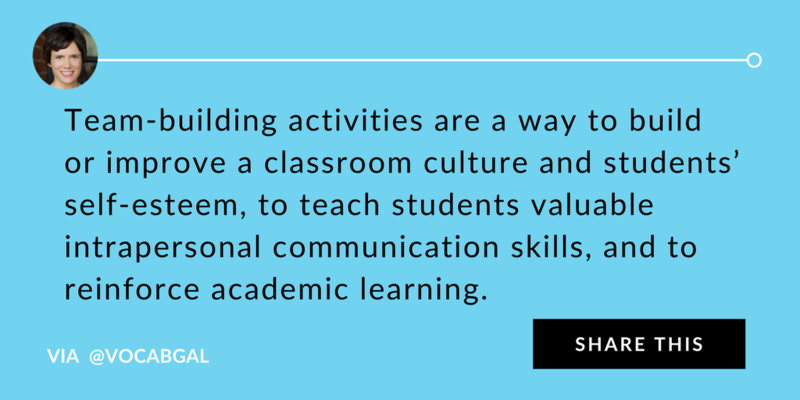 It’s critical to help develop students’ social interaction skills, which can easily be done in the classroom through team-building activities. When team-building activities are used routinely in classrooms, the classroom space becomes a shared, safe zone where students feel comfortable and ready to learn. These short games not only allow students to gain valuable skills, but also develop empathy and often improve their self-esteem. Most activities should only take between five and ten minutes and can be used once or on multiple occasions. Classroom time is valuable, and these activities are designed to minimize time and maximize outcome. This is a rather quick and silly team-building activity for high school students. 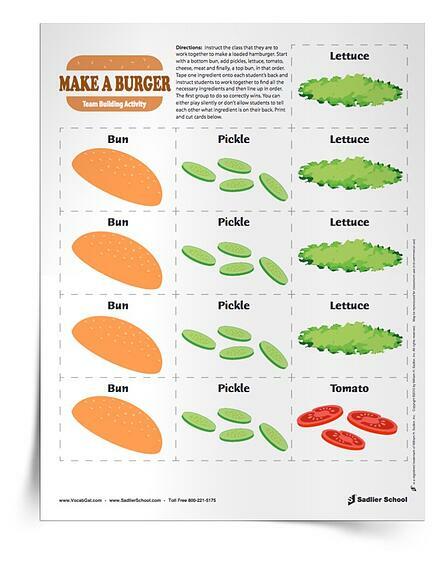 Instruct the class that they are to work in groups to make a full hamburger that starts with a bun, and that has pickle, lettuce, tomato, cheese, meat and another bun in that order. Tape one ingredient onto each student’s back and instruct students to work together to find all the necessary ingredients and then line up in order. The first group to do so correctly wins. You can either play silently, or you can tell students to say what ingredient is on their backs, but instead only provide hints. Academic Focus: Replay this game using vocabulary words and definitions, planet names, math problems and solutions, and so on. Have students stand in a circle. The first student chooses a subject-related word and acts out a motion that corresponds with the word’s meaning in some way. The rest of the students in the group then echo the word and the motion together. The next student in the group chooses a new word and acts out a corresponding motion. The rest of the students then echo that word and motion, followed by the first student’s word and motion. This sequence repeats until all students in the group have their own word and motion and have reiterated everyone else’s word and motion. To begin the game, the first student says his/her word and motion and then says another student’s word and motion. That student must say his/her word and motion and pick another student’s word and motion. The game repeats until a called-upon student cannot recall another’s word and motion fast enough (three seconds) and is “out.” When only two people are left, both are winners. Caveat: no student can reiterate the previous student’s word and motion. Academic Focus: By creating motions tied to academic vocabulary and reiterating these words and motions numerous times, students develop deep connections to these words. Try playing this game throughout the year, and have students use their peers’ previous words and motions to call upon them, as well as current words and motions. Often, students feel disgruntled about school, so this team-building activity for high school students encourages everyone to look for the positive, rather than the negative. 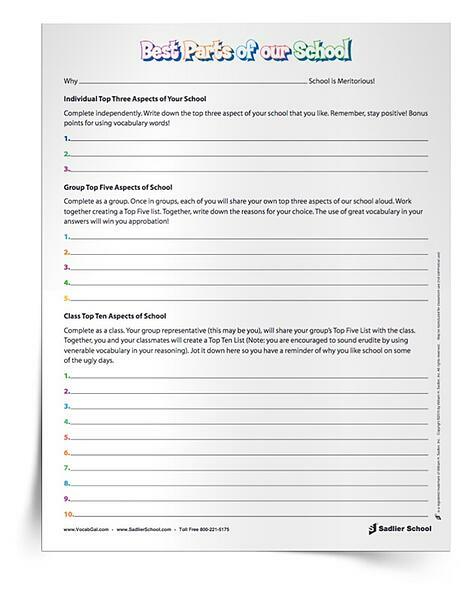 First, each individual should complete the top of the handout, listing three specific aspects of their school they like. Then, assign students to groups of approximately four to six, making sure that students work with people they do not know well, rather than simply working with friends. Have the students each share their three ideas in their groups, and then work together to choose which ones to include in a group list of five positive aspects about their school. Next, each group selects a representative to go to the board to write down his or her group’s list. Finally, the representatives and work with the whole class in order to combine the top five lists into one class-wide top ten list. Try to post this list so students remember both working together and the positive aspects of school! Academic Focus: Ask students to use academic vocabulary in their lists or to utilize strong writing techniques, such as action verbs or figurative language, when creating each point. 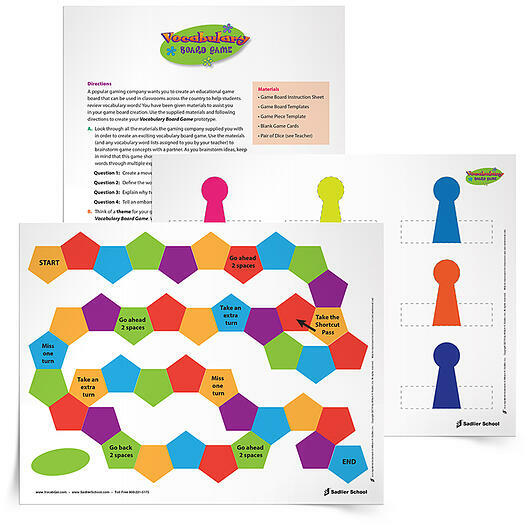 Students love to play board games, so asking them to design their own provides them with a new and exciting challenge. Have students work together, possibly by formatively assessing their understanding of a concept and then grouping them in high-medium-low understanding groups. Alternatively, grouping them in like-understanding (all highs, all mediums, all lows) partnerships can also allow for thoughtful outcomes. Academic Focus: Take any unit that needs further review or understanding and ask students to create a board game that highlights various aspects of the concept. Students write down three aspects of themselves that no one else knows. Assign students to groups of three or four and ask them to read their information to each other. Each day, have one member of the group read all of the group’s fact sheets to begin the class and have the rest of the students guess which group member is which. Have students celebrate one another’s unique selves, and make sure to reiterate the need to respect each other. Academic focus: Encourage students to use academic vocabulary when describing themselves. In order for activities to be successful, classroom leaders must establish clear expectations. The most important aspect of team-building activities is that they demonstrate that the classroom is a safe zone. When working through the team-building activities with students, I emphasize my number one rule, which is mutual respect and acceptance. Students must remain positive and respectful toward their fellow learners, and that includes me! In a classroom, a sense of community is vital in order for students to produce authentic writing, to receive constructive feedback from peers, and to have meaningful discussions. By emphasizing in each activity the importance of trusting one another, classroom leaders build a sense of classroom community. These team-building activities encourage students to empathize with their classmates who may be different from them and will also help to build up their own self-esteem as they work with others. Classroom leaders must stress the need for students to learn from one another and to respect the similarities and differences that all of their classmates bring to each activity. I always like to ensure that there is an academic purpose to all aspects of classroom activities, so, as a classroom leader, I ask students to use academic vocabulary and to utilize their prior learned knowledge during discussions. Finally, if a classroom leader faces significant resistance from students, framing the activity as a challenge or competition can motivate them. Do remember to emphasize that the competition or challenge being carried out can be completed by everyone and that respect and ethical behavior is paramount, as some students may attempt to cheat in order to win. 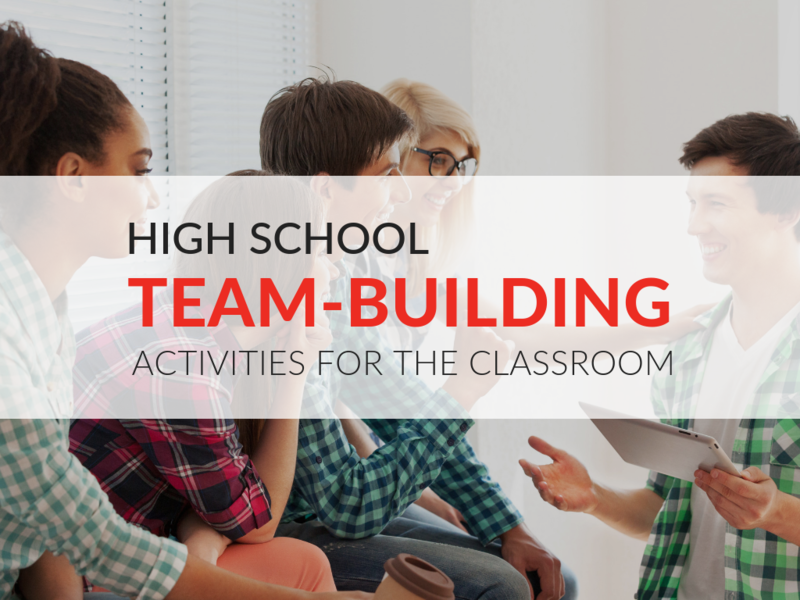 Team-building activities can happen throughout the school year. They can be used for a myriad of reasons and for a multitude of purposes. Some classroom leaders may want to use these activities at the beginning of the school year in order to establish a classroom culture and then continue to use activities once or twice a quarter to re-establish concepts, review learning, or deepen rapport. Other teachers may use them later in the year or the start of the second semester in order to re-focus a classroom or for a specific unit of study. Alternatively, classroom leaders can employ team-building activities at the end of the year to encourage more authentic peer review for assignments or as a new challenge for students. Team-building is fun and has a huge number of benefits, from developing classroom community to reinforcing academic concepts. Each of the five team building activities allows students to learn with and from each other, and deepens connections between peers. As students become more and more disconnected from their peers and their learning because they spend much of their time on social media, team-building activities are a great way to reconnect students to their school and to their education, and to have fun while doing so.